Father of two amazing children, Pulsar Astronomer, Python Developer, Open Source Advocate, Hardware Hacker, Amateur Sys-Admin, Web Developer, and Receiver and IF/LO specialist with the Arecibo Observatory. My undergraduate work was with the Center for Advanced Radio Astronomy (CARA), within the University of Texas at Brownsville. 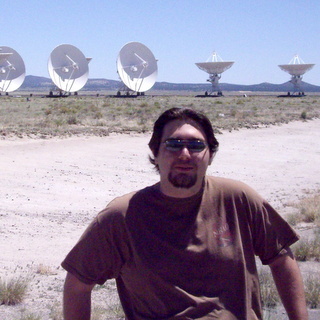 I find the field of Radio Astronomy amazingly interesting, bringing my interests in electronics, computer science, and physics and astronomy together. I eventually worked my way from observational astronomy to instrumentation. I was in charge of the first iteration of the analog signal path for the Low Frequency All-Sky Monitor (LoFASM) project with CARA. I was also responsible for designing the data recording servers and firewall systems. As part of my participation with CARA, I was an avid observer with both the Arecibo Radio Telecope and the Green Bank Telescope, participating in numerous pulsar surveys, as well as being responsible for planning and executing a variety of pulsar candidate follow up and timing campaigns.